═══════════════════════════════ R abbi Arik Labowitz - Berkeley, CA Dear Moshe, I wanted to thank you again for coming to my home and doing such an amazing job teaching and taking care of this Torah. Everyone that attended the workshop could not offer enough praise for your depth of knowledge and your ability to connect with your audience. You have a rare gift and I'm so glad that you were able to share it with us. Perhaps we can make this an annual event. In the meantime please let me know when you'll be back in the bay area. Blessings to you and your family for a sweet and rejuvenating Shabbat, Arik ═══════════════════════════════ S amantha Hammontree - Project Chair Head - Congregation Beth Torah, KS Congregation Beth Torah in 2013 celebrated our 25th Anniversary. This joyous occasion was celebrated in conjunction with launching our Torah project through Sofer On Site! Within just days of taking on this project, our founding Rabbi announced his retirement. As the Chairperson for the 25th Anniversary and the Torah Writing Experience, we established a goal of hoping to raise $500,000. It was crucial that we had a well polished and strategic approach to our marketing campaign. As President of my company, my time is limited. These two giant projects wouldn’t be without great leadership and I knew it would take an incredible volunteer steering committee as well as partnership with Sofer On Site. I definitely understood the significance marketing would play when developing a successful campaign. I was somewhat hesitant on relying on Sofer On Site as a source for our marketing and publicity materials because we had an internal communications and graphic designer on staff at Beth Torah. However, it didn’t take long for me to realize the talent of Shmuel Goldstein, my day-to-day point of contact. Shmuel’s professionalism and collaboration skills have been invaluable It is rare that you find someone who has both the creative ability, copywriting skills and technical side as well. This combination helps us get things done quickly. He has always made himself available, which fits great with my hectic and very busy schedule. He is personable, extremely patient, friendly and easy to work with. His ability to rapidly put our thoughts and ideas onto paper is really amazing and creates great efficiencies so I can devote my time elsewhere. There is no doubt that in the course of working with him on our project, we’ve not only gained a great resource and talent, but a friend as well. Sincerely, ═══════════════════════════════ J ohn Kohn - Vice President - Mickve Israel, Savannah, GA Rabbi, I just wanted to take a moment to tell you how much Rabbi Salazar's visit to our Temple was appreciated. He, like other people at Sofer-on-Site, shares and exudes his love for Torah. It is contagious. Many people took the time to let me know how meaningful it became to scribe a letter in the new Torah we are getting. Before the event, most of the signers were not sure what they would get from the experience. Afterwards many gushed about what they received. This is a tribute to Torah and to Rabbi Salazar who is able to relate so well with each person and make the moment special & educational. My wife was one of the students in the Holy Rollers class. When she got home at 10 PM, she spent the next 30 minutes telling me all about it. She was all excited about being involved. As it turns out one of the local TV stations (WJCL, the NBC affiliate) came by and did a short story about our new Torah. One of our congregant families was shown and Rabbi Salazar was interviewed. We could not have asked for more. Thank you to all that are involved with us. ═══════════════════════════════ R abbi Marcy Delbick & Barb English Temple Beth El Salinas, CA Our visit with the Sofer On Site was both educational and inspirational. As we participated in writing the Torah, Rabbi Druin connected each person to his or her letter, demonstrating that just as every letter of the Torah matters and is unique and significant so is each person taking part in writing it. It was a once in a lifetime experience for us and a weekend we will never forget. We also want to thank Rabbi Shmuel Goldstein for all his time, patience and wondrous knowledge of the computer. His graphic design helped created a beautiful certificate for our members, one in which we will cherish forever. It has been a pleasure to work with such an efficient staff as Sofer On Site and we hope to be able to work with them again in the future. ═══════════════════════════════ S andy Crile - Temple Beit HaYam Stuart, FL Thank you for all your assistance with our Torah restoration day. Rabbi Selwyn was WONDERFUL!!! He was great with the kids as well as the adults. Everyone came away so appreciative of the attention he gave them and with his knowledge of Torah restoration and the magic of letters. He also has a wonderful sense of humor. Shalom, Sandy Crile _________________ Beth Pennamacoor - Religious School Director, Temple Beit HaYam Stuart, FL Rabbi Selwyn was awesome with the kids. They all loved the presentation, the whole Family Ed Day and the experience. ═══════════════════════════════ D avid Miller - Temple Beth Sholom - Santa Fe, NM I've had such a wonderful week working with Shmuel Goldstein that I wanted to share with you the following thoughts. Over a close to fifty year career in marketing communications, working with some of finest designers in the country on some of the top brands in the world, I've come to realize how difficult the process of interaction between clients and creative vendors or between even two creative colleagues can be. Often there is an immense clash of creative ego involved because one individual is offering another their best thinking, their creative vision, their very sense of how to communicate an idea. There's a lot of rough bumps behind the development of the finished product. Working with Reb Goldstein has been the opposite experience for me. He's open to hearing my ideas; gently inserts his thought or counter ideas if he thinks he has a better solution; and makes the entire process collaborative, easy and yes, even fun. That of course, applies to the development of the attention getting, creative materials we've developed to launch and create an atmosphere of support for our Holocaust Torah Restoration Project (HTRP). When it comes to the technology of interacting at great distance, his speed and ability to help even technological neophytes (or is that Luddites) like myself makes the process even better. (He's helped me overcome my reluctance to engage in the new collaborative program offered by Google Docs. I was initially hesitant both because of time it takes to learn something new and because I wasn't certain it would be worth the effort. It doesn't take a long time and it's definitely worth it. And Reb Goldstein is a master teacher and fun to work with.) Lastly, let me say that even before we have formally launched our project and way ahead of seeing the hopefully sizable success of our economic campaign, I feel our TBS Board made the right choice in selecting Sofer On Site and contracting for the highest level of input and advice from Sofer On Site. It's money well spent and Reb Goldstein is a large part of the reason why. ═══════════════════════════════ D r. Mark Eisenberg - The Community Synagogue - Port Washington, NY Since completing our new Sefer Torah we have been blessed to be able to have our Bar and Bat Mitzvahs chant from it as they read from Torah for the first time. The experience that we had scribing the Torah was something that touched our congregation in very deep ways and will always be remembered by each of the families that participated. It was particularly special for me to watch how moved people became and how deeply touched they were when they came up for their turn to write "their" letter in our Torah. Thank you for partnering with us and helping our congregation fulfill the mitzvah. _________________ Rabbi Irwin Zeplowitz, Senior Rabbi - The Community Synagogue From the first meeting with Rabbi Druin years before the project began to threading the parchment and rolling the Torah at the very end of the process, I was moved by the passion, professionalism, compassion and caring that was brought to the writing of our congregational Torah by "Sofer On Site." It was a joy to see the way each individual and every family who wrote a letter was given the time to learn how "their" letter had relevance for them. The process of learning was never rushed, and from our youngest preschoolers to home bound seniors, "Sofer On Site" helped make the Torah a living part of their Jewish lives. In addition to the great honor of sharing with the other clergy at the synagogue in writing the first and final letters, I joined my family in writing the 'aleph' in the word 'or' - the 'light' created by the Holy One at the beginning. Our family was inspired by the light of Torah learning - and participating with so many hundreds of others in our community Torah. ═══════════════════════════════ R abbi Josh Snyder - Hillel at Goucher College - Baltimore, MD Thank you Reb Gedalia so very much for your wonderful job in leading our Torah Writing and dedication events. People could not stop talking about you and the experience. I appreciate your ability to both welcome and challenge participants to think about the meaning and significance of the act of writing a Sefer Torah. Some of what you said has become a big point of how I talk about Torah. Our community grew up in many ways around these events, in essence we have been called to the Torah. Thank you for your flexibility, sense of humor, attention to detail and love for Torah and Yiddishkeit. ═══════════════════════════════ Ja ck Cohen - Congregation B'nai Torah - Saint Peters, MO Our Torah was in bad shape, and no longer kosher when we contacted Sofer On Site. The Czech Memorial Trust, which had provided the Torah to us on a permanent loan 20 year earlier recommended your scribes as most qualified to restore this Torah which had survived the Holocaust. Our expectations were high. You exceeded our expectations. We believe that Hashem bestowed this Torah upon us, and that He directed our search to you. More importantly, He gave you the skill to restore the letters and words that had fallen off the parchment to allow our continued prayers from a kosher Torah. ═══════════════════════════════ J udy Yambra - Congregation Beth Yeshurun, TX While our year long Torah scribing truly helped to create incredibly meaningful connections to Torah and the congregation for our members, as chairs of the event, we also created fabulous relations with the Sofer On Site Staff. Our scribes, Rabbi Levi Selwyn, Rabbi Moshe Druin and Rabbi Gedallia Druin (who I affectionately referred to as "Papa Druin" to tell the difference) were amazing with every person who scribed. And we give great kudos to Rabbis Shmuel Goldstein who was a TREMENDOUS help with many of our marketing pieces. He's creative, generous with his time and always very prompt with return calls and e-mails. He ALMOST got us to use Google Docs and even though we didn't, he was helpful, patient and a very kind "nudge" when he needed information. We are truly thankful for the advice (not all of which was taken :-)) and feel very blessed to have been part of what has been the most special experience our congregation has had or will have for many years to come. _________________ Brian Strauss - Congregation Beth Yeshurun, TX A terrific experience. The scribes were engaging, warm, and made everyone's experience a memorable one. I was amazed by their attention to detail and accessibility. _________________ Andrea Stein - Congregation Beth Yeshurun, TX It has been a joy to witness so many families and individuals take their place with the scribe and write a letter in the Torah, thereby performing the 613th commandment - to write a Torah. We know by the tears and smiles we've seen that a most meaningful connection to the Torah and to Beth Yeshurun has been experienced by all who participated. We give out heartfelt thanks and immeasurable gratitude to Sofer On Site, who have given of their time and expertise to insure the success of this project. Their professional work and services made us look great! They are the reason this project worked! ═══════════════════════════════ R abbi Arik Labowitz - Berkeley, CA Dear Moshe, I wanted to thank you again for coming to my home and doing such an amazing job teaching and taking care of this Torah. Everyone that attended the workshop could not offer enough praise for your depth of knowledge and your ability to connect with your audience. You have a rare gift and I'm so glad that you were able to share it with us. Perhaps we can make this an annual event. In the meantime please let me know when you'll be back in the bay area. Blessings to you and your family for a sweet and rejuvenating Shabbat, Arik ═══════════════════════════════ S amantha Hammontree - Project Chair Head - Congregation Beth Torah, KS Congregation Beth Torah in 2013 celebrated our 25th Anniversary. This joyous occasion was celebrated in conjunction with launching our Torah project through Sofer On Site! Within just days of taking on this project, our founding Rabbi announced his retirement. As the Chairperson for the 25th Anniversary and the Torah Writing Experience, we established a goal of hoping to raise $500,000. It was crucial that we had a well polished and strategic approach to our marketing campaign. As President of my company, my time is limited. These two giant projects wouldn’t be without great leadership and I knew it would take an incredible volunteer steering committee as well as partnership with Sofer On Site. I definitely understood the significance marketing would play when developing a successful campaign. 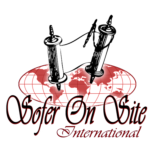 I was somewhat hesitant on relying on Sofer On Site as a source for our marketing and publicity materials because we had an internal communications and graphic designer on staff at Beth Torah. However, it didn’t take long for me to realize the talent of Shmuel Goldstein, my day- to-day point of contact. Shmuel’s professionalism and collaboration skills have been invaluable It is rare that you find someone who has both the creative ability, copywriting skills and technical side as well. This combination helps us get things done quickly. He has always made himself available, which fits great with my hectic and very busy schedule. He is personable, extremely patient, friendly and easy to work with. His ability to rapidly put our thoughts and ideas onto paper is really amazing and creates great efficiencies so I can devote my time elsewhere. There is no doubt that in the course of working with him on our project, we’ve not only gained a great resource and talent, but a friend as well. Sincerely, ═══════════════════════════════ J ohn Kohn - Vice President - Mickve Israel, Savannah, GA Rabbi, I just wanted to take a moment to tell you how much Rabbi Salazar's visit to our Temple was appreciated. He, like other people at Sofer-on-Site, shares and exudes his love for Torah. It is contagious. Many people took the time to let me know how meaningful it became to scribe a letter in the new Torah we are getting. Before the event, most of the signers were not sure what they would get from the experience. Afterwards many gushed about what they received. This is a tribute to Torah and to Rabbi Salazar who is able to relate so well with each person and make the moment special & educational. My wife was one of the students in the Holy Rollers class. When she got home at 10 PM, she spent the next 30 minutes telling me all about it. She was all excited about being involved. As it turns out one of the local TV stations (WJCL, the NBC affiliate) came by and did a short story about our new Torah. One of our congregant families was shown and Rabbi Salazar was interviewed. We could not have asked for more. Thank you to all that are involved with us. ═══════════════════════════════ R abbi Marcy Delbick & Barb English Temple Beth El Salinas, CA Our visit with the Sofer On Site was both educational and inspirational. As we participated in writing the Torah, Rabbi Druin connected each person to his or her letter, demonstrating that just as every letter of the Torah matters and is unique and significant so is each person taking part in writing it. It was a once in a lifetime experience for us and a weekend we will never forget. We also want to thank Rabbi Shmuel Goldstein for all his time, patience and wondrous knowledge of the computer. His graphic design helped created a beautiful certificate for our members, one in which we will cherish forever. It has been a pleasure to work with such an efficient staff as Sofer On Site and we hope to be able to work with them again in the future. ═══════════════════════════════ S andy Crile - Temple Beit HaYam Stuart, FL Thank you for all your assistance with our Torah restoration day. Rabbi Selwyn was WONDERFUL!!! He was great with the kids as well as the adults. Everyone came away so appreciative of the attention he gave them and with his knowledge of Torah restoration and the magic of letters. He also has a wonderful sense of humor. Shalom, Sandy Crile _________________ Beth Pennamacoor - Religious School Director, Temple Beit HaYam Stuart, FL Rabbi Selwyn was awesome with the kids. They all loved the presentation, the whole Family Ed Day and the experience. ═══════════════════════════════ D avid Miller - Temple Beth Sholom - Santa Fe, NM I've had such a wonderful week working with Shmuel Goldstein that I wanted to share with you the following thoughts. Over a close to fifty year career in marketing communications, working with some of finest designers in the country on some of the top brands in the world, I've come to realize how difficult the process of interaction between clients and creative vendors or between even two creative colleagues can be. Often there is an immense clash of creative ego involved because one individual is offering another their best thinking, their creative vision, their very sense of how to communicate an idea. There's a lot of rough bumps behind the development of the finished product. Working with Reb Goldstein has been the opposite experience for me. He's open to hearing my ideas; gently inserts his thought or counter ideas if he thinks he has a better solution; and makes the entire process collaborative, easy and yes, even fun. That of course, applies to the development of the attention getting, creative materials we've developed to launch and create an atmosphere of support for our Holocaust Torah Restoration Project (HTRP). When it comes to the technology of interacting at great distance, his speed and ability to help even technological neophytes (or is that Luddites) like myself makes the process even better. (He's helped me overcome my reluctance to engage in the new collaborative program offered by Google Docs. I was initially hesitant both because of time it takes to learn something new and because I wasn't certain it would be worth the effort. It doesn't take a long time and it's definitely worth it. And Reb Goldstein is a master teacher and fun to work with.) Lastly, let me say that even before we have formally launched our project and way ahead of seeing the hopefully sizable success of our economic campaign, I feel our TBS Board made the right choice in selecting Sofer On Site and contracting for the highest level of input and advice from Sofer On Site. It's money well spent and Reb Goldstein is a large part of the reason why. ═══════════════════════════════ D r. Mark Eisenberg - The Community Synagogue - Port Washington, NY Since completing our new Sefer Torah we have been blessed to be able to have our Bar and Bat Mitzvahs chant from it as they read from Torah for the first time. The experience that we had scribing the Torah was something that touched our congregation in very deep ways and will always be remembered by each of the families that participated. It was particularly special for me to watch how moved people became and how deeply touched they were when they came up for their turn to write "their" letter in our Torah. Thank you for partnering with us and helping our congregation fulfill the mitzvah. _________________ Rabbi Irwin Zeplowitz, Senior Rabbi - The Community Synagogue From the first meeting with Rabbi Druin years before the project began to threading the parchment and rolling the Torah at the very end of the process, I was moved by the passion, professionalism, compassion and caring that was brought to the writing of our congregational Torah by "Sofer On Site." It was a joy to see the way each individual and every family who wrote a letter was given the time to learn how "their" letter had relevance for them. The process of learning was never rushed, and from our youngest preschoolers to home bound seniors, "Sofer On Site" helped make the Torah a living part of their Jewish lives. In addition to the great honor of sharing with the other clergy at the synagogue in writing the first and final letters, I joined my family in writing the 'aleph' in the word 'or' - the 'light' created by the Holy One at the beginning. Our family was inspired by the light of Torah learning - and participating with so many hundreds of others in our community Torah. ═══════════════════════════════ R abbi Josh Snyder - Hillel at Goucher College - Baltimore, MD Thank you Reb Gedalia so very much for your wonderful job in leading our Torah Writing and dedication events. People could not stop talking about you and the experience. I appreciate your ability to both welcome and challenge participants to think about the meaning and significance of the act of writing a Sefer Torah. Some of what you said has become a big point of how I talk about Torah. Our community grew up in many ways around these events, in essence we have been called to the Torah. Thank you for your flexibility, sense of humor, attention to detail and love for Torah and Yiddishkeit. ═══════════════════════════════ Ja ck Cohen - Congregation B'nai Torah - Saint Peters, MO Our Torah was in bad shape, and no longer kosher when we contacted Sofer On Site. The Czech Memorial Trust, which had provided the Torah to us on a permanent loan 20 year earlier recommended your scribes as most qualified to restore this Torah which had survived the Holocaust. Our expectations were high. You exceeded our expectations. We believe that Hashem bestowed this Torah upon us, and that He directed our search to you. More importantly, He gave you the skill to restore the letters and words that had fallen off the parchment to allow our continued prayers from a kosher Torah. ═══════════════════════════════ J udy Yambra - Congregation Beth Yeshurun, TX While our year long Torah scribing truly helped to create incredibly meaningful connections to Torah and the congregation for our members, as chairs of the event, we also created fabulous relations with the Sofer On Site Staff. Our scribes, Rabbi Levi Selwyn, Rabbi Moshe Druin and Rabbi Gedallia Druin (who I affectionately referred to as "Papa Druin" to tell the difference) were amazing with every person who scribed. And we give great kudos to Rabbis Shmuel Goldstein who was a TREMENDOUS help with many of our marketing pieces. He's creative, generous with his time and always very prompt with return calls and e-mails. He ALMOST got us to use Google Docs and even though we didn't, he was helpful, patient and a very kind "nudge" when he needed information. We are truly thankful for the advice (not all of which was taken :-)) and feel very blessed to have been part of what has been the most special experience our congregation has had or will have for many years to come. _________________ Brian Strauss - Congregation Beth Yeshurun, TX A terrific experience. The scribes were engaging, warm, and made everyone's experience a memorable one. I was amazed by their attention to detail and accessibility. _________________ Andrea Stein - Congregation Beth Yeshurun, TX It has been a joy to witness so many families and individuals take their place with the scribe and write a letter in the Torah, thereby performing the 613th commandment - to write a Torah. We know by the tears and smiles we've seen that a most meaningful connection to the Torah and to Beth Yeshurun has been experienced by all who participated. We give out heartfelt thanks and immeasurable gratitude to Sofer On Site, who have given of their time and expertise to insure the success of this project. Their professional work and services made us look great! They are the reason this project worked!